"Milan Kundera called Witold Gombrowicz 'one of the great novelists of our century.' 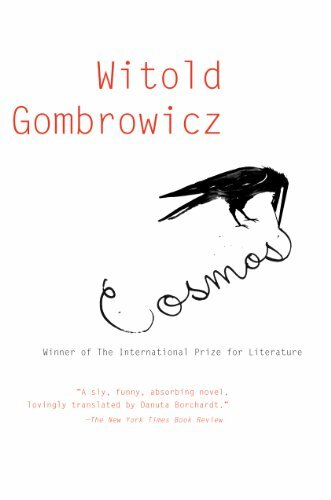 His most famous novel, Cosmos, the recipient of the 1967 International Prize for literature, is now available in a critically acclaimed translation, for the first time directly from the Polish, by an award-winning translator. Cosmos is a metaphysical noir thriller narrated by Witold, a seedy, pathetic, and witty student, who is charming and appalling by turns. On his way to a relaxing vacation he meets the despondent Fuks. As they set off together for a family-run pension in the Carpathian Mountains they discover a dead bird hanging from a string. Is this a strange but meaningless occurrence or is it the beginning of a string of bizarre events. As the young men become embroiled in the Chekhovian travails of the family running the pension Grombrowicz’s creates a gripping narrative where the reader questions who is sane and who is safe."